Nothing reflects the personality of a homeowner like the furniture in their living room or den. And nothing catches the eye in your living space like the entertainment center. This is why savvy home owners who wish to display their tastes for sophistication, grandeur and good living need to check out the Paris Entertainment Center: Sophistication Personified from Weaver Furniture Sales. With its impeccable design and cabinetwork, the solid hardwood Paris Entertainment Center is the epitome of sophistication and functionality. From its elaborate crown molding to the ornate trim at the base, the Paris Entertainment Center delights the eye. Notice the bold, column-like woodwork that flanks the center console and side cabinets. And add to that the perfectly handcrafted raised panel drawers and glass doors. 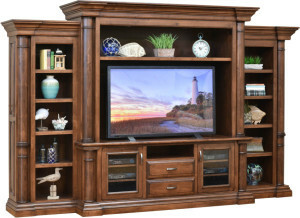 Indeed, you’ll be hard pressed to find a solid hardwood entertainment center more spectacular! Yet, the Paris Entertainment Center is as functional as it’s beautiful. At 66 inches wide by 50 inches high, the TV area is large enough for your big-screen TV. Also, behind the two glass doors, you’ll find room for all your TV and stereo equipment. The open bay is a handy spot to keep your devices close to hand. In addition, the two drawers give you even more storage space. Both the drawers and doors come equipped with a soft-close feature. So closing them is as simple as giving an open drawer or door a gentle push. Plus, dovetail drawer joints enhance strength and durability. The Amish designers created five shelves in each side cabinet. Plus a shelf above the TV. So homeowners get lots of space to display figurines, books, CDs, DVDs and more. It’s no coincidence that the Paris Entertainment Center bears all the hallmarks of superior cabinetmaking. That’s because the best cabinetmakers in the Midwest — Amish men – skillfully handcraft each unit. Also, the Amish artisans use quality regional hardwoods. Such as maple, cherry, oak and hickory. As a result, the entertainment center is of incredibly sturdy and durable. In fact, with proper care, it should easily become a family heirloom. What’s more, you can order the entertainment center as shown. Or, you can give your specifications to Weaver’s expert associates. For example, you can choose the wood specie, finish and hardware. And within a short time, you’ll get your custom-made Paris Entertainment Center: Sophistication Personified. You can explore the Paris Entertainment Center at Weaver Furniture Sales’ online store. Or, you can visit Weaver Furniture Sales in person at their ‘brick and mortar’ store in Shipshewana, Indiana.